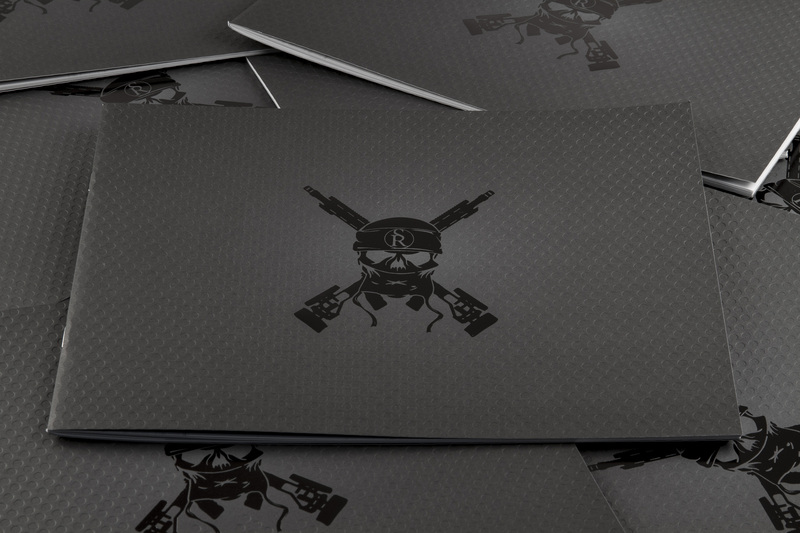 Surgeon Rifles, a premier manufacturer of high-end precision firearms, approached Stoke Interactive to help create their 2015 product catalog. In today’s world of all things digital, an opportunity for print work is always exciting for us! 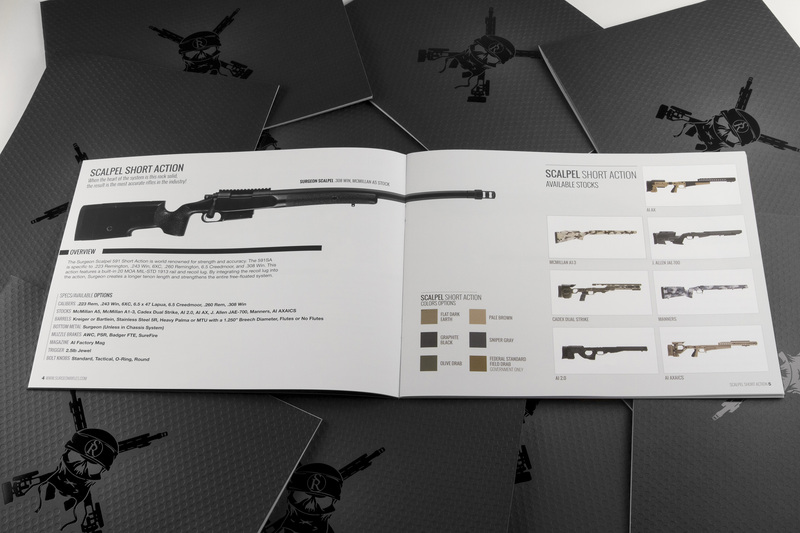 In addition to designing a catalog that would showcase their products, we had two specific goals for the Surgeon Rifles project: To deliver a catalog that would reflect their status as a leader in their industry and to create it in a way that increased the shelf life. So much goes into a print catalog and the content is so important that we want customers to want to hang onto them instead of tossing them away. For us, this meant the freedom to have fun in designing something that would really stand out in a saturated market. To achieve our goals, we incorporated textures and objects from the company’s arsenal: metals, patterns, blueprints, and stock color options. For the cover, we used an embossing process on matte paper to create a custom texture covering the front and rear, with a foiled logo. The foiling process uses heat, pressure, metal dies, and a foil film to create a shiny and durable finish that stands out on a matte background. On the inside of the catalog, we kept the layout clean and consistent. The title pages used screened back blueprints and custom patterns to create light textures. Strong fonts, such as Oswald, and high-production photography helped the content of the product pages stand out on their own. To add to the high-end feel (literally) the interior pages were coated using a soft-touch printing processes leaving a slight velvet feeling to every page. Content wise, the catalog consisted of their four primary rifles (with stock options, specs, and descriptions), special edition rifles, actions, suppressors, and other accessories (optics, scopes, bottom metals, bipods, etc.). Even with the significant amount of content, we were able to retain the clean and simple layout, keeping it concise and to the point. Throughout this process we were also working hard on their new website, allowing us to keep the brand image strong and consistent. After all, half of the fun is figuring out how to bring the tangible print world into the digital era, and vice-versa.